In beautiful County Kerry, between Beaufort village and the Gap of Dunloe the traveler that visits here will be rewarded, for eight stones inscribed with Ogham have been collected here. 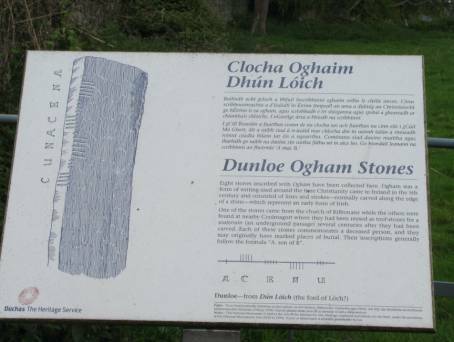 Seven of the eight Ogham stones in this group were discovered in Coolmagort in the nineteenth century and have been set up on this site close to Dunloe Castle. These seven stones were originally the roofs of a souterrain or underground passage, which collapsed at the end of the last century, several centuries after they had been carved. Because of their long protection from exposure, the Dunloe inscriptions are unusually well preserved. 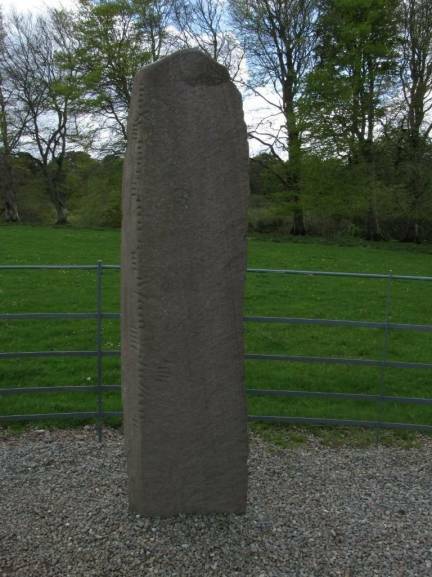 The tallest of the Ogham Stones is 8 feet high. The strokes are marked along the edge of the stone. Ogham (pronounced OH-yam) was a form of writing dating from the 3rd century AD. It consisted of lines and strokes normally carved at the edge of a stone, which represents an early form of Irish. Oghams were thought to be the writing of Druids and Bards, and having a close relationship with nature they associated the energy that corresponds to individual trees to the Oghams. The left front edge of this Ogham Stone shows the strokes facing away from the edge. If you look closely at the left front edge of this Ogham stone you will see strokes facing away from the edge. The edge of the stone forms the main vertical line of the Ogham. In studying the Oghams you will note that there is a central line of the marking in which all the strokes share, the strokes either face to the right of the line or to the left of the line, as some cross the line and others cross the line at an angle. Here is a further illustration of this from a marker at the site. Illustration of the strokes along the edge of the stone. Each of these stones commemorates a deceased person and the details of his descent. They may originally have marked places of burial. 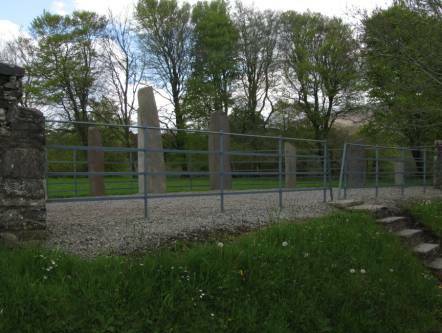 It was an amazing experience to see the Ogham Stones, for two reasons. The first was to be able to be so close to ancient artifacts that are such an important part of Ireland’s past. There were no fences to keep anyone out, so we were able to get very close and touch the stones. The other reason it was so great was that I felt it exemplified the current Irish culture. They have such a great respect for history that there is no need to keep stones like this in glass cases or behind fences. We just parked the car and walked right up to them. It truly was a moment I will never forget. 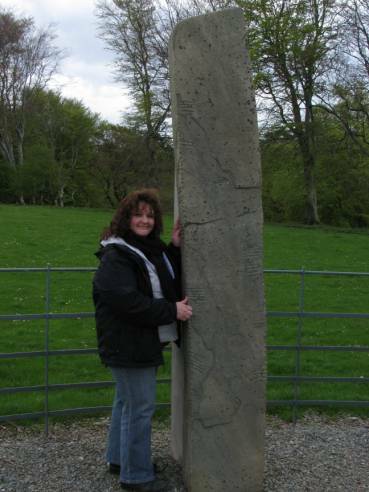 During my trip to Ireland, we came across several Ogham Stones in our travels. When I think about how the written word has evolved, it is amazing that even then, people had communication as advanced as this. The Ogham alphabet is written right to left and bottom to top and the time put into the stones was painstakingly careful and extensive. Anyone still fluent in this written form of language would still be able to read most, if not all, of the messages left behind as the stones were very well done and, considering Ireland’s penchant for rainy weather and its numerous invasions, is indeed a miracle that they have survived.